This is a used Kinect in good condition. Microsoft Xbox 360 Kinect Connect Black Sensor Bar Model # 1414 *Tested*. Condition is Used. Shipped with USPS Priority Mail. Xbox 360 Kinect Sensor Official Black (USED). Condition is Used. Shipped with USPS Priority Mail. Microsoft Xbox 360 Kinect Motion Sensor Bar Model 1414 Official Genuine OEM. - Works for Xbox 360 S & E models. - Item might show signs of wear and scratches, however tested and works 100%. This is an Xbox 360 Kinect. It is used with a few superficial scratches on the black part. xbox 360 kinect Sensor. Condition is New. Shipped with USPS Priority Mail. Microsoft xbox 360 kinect camera. Condition is Used. Shipped with USPS Priority Mail. Kinect Adventures! Condition is Used. Kinect MotionSensor Bar - Model 1414. I want you happy!I have a policy to always treat everyone the way that I would like to be treated! I am always happy to discuss any details or concerns that you may have and find answers or solutions that will make everyone happy. Microsoft Xbox 360 Kinect Motion Sensor Bar Official Genuine OEM. Condition is Used. Shipped with USPS Priority Mail. Kinect for xbox 360 and the on top of TV mount. Microsoft Xbox 360 Kinect Connect Black Sensor Bar. Condition is New. Shipped with USPS First Class Package. 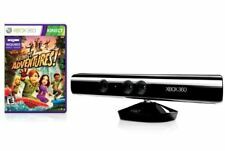 Xbox 360 kinect sensor with games. Condition is Used. Shipped with USPS Parcel Select Ground. For sale we have a black Original Genuine Microsoft Xbox 360 Kinect Sensor Bar! Tested and working! Has some scratches on the outside but doesn't affect gameplay at all but I feel that it needs to be mentioned also. If you have any questions feel free to ask and thank you for watching! Xbox 360 Kinect Plus Extra. Condition is Very Good. Comes as shown.